Festive Season 2017 marked a major turning point for UK retailers. Our Festive Season Wrap-up Report is out now, and dives into how UK retailers have fully addressed omnishopping behavior, enabling shoppers to buy whenever, wherever, on any device. Despite economic concerns surrounding inflation, wage stagnation and Brexit, Criteo data shows that UK shoppers were ready to gift. 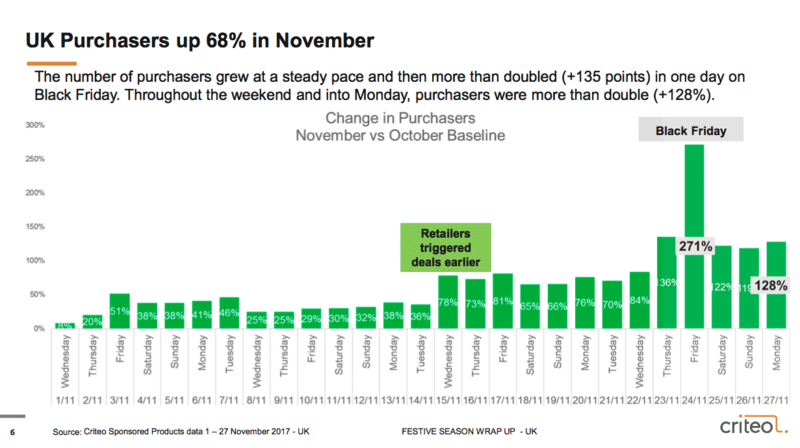 Criteo data shows that Black Friday has successfully become a significant retail holiday in the UK. While some retailers chose to sit out this year, others solved inventory challenges that had turned off shoppers in previous years. The number of people purchasing increased 3X over an average day in October. Both November and December showed significant spikes in shopping and purchasing. 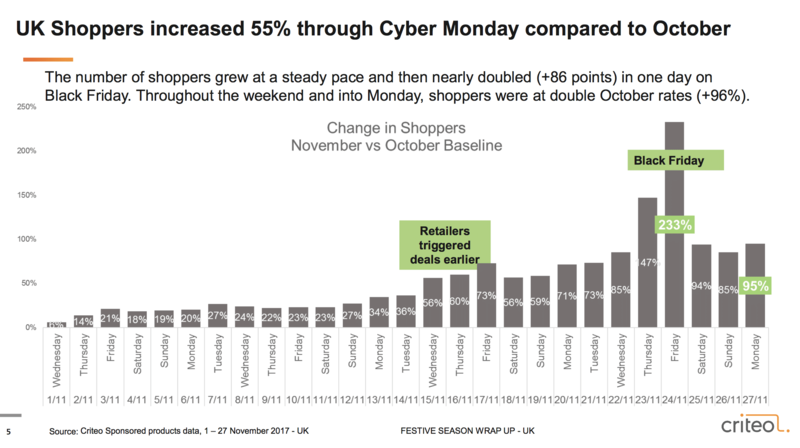 As a result, mobile commerce broke all previous Criteo records on key days: 58% on Black Friday, 78% the weekend before Christmas. Key takeaways from Festive Season 2017 indicate that omnishopping behavior fueled retail growth around the world, but especially in the UK. Criteo surveyed nearly 10,000 shoppers globally in 2017 to understand how people shop. In the UK, 83% of shoppers use a variety of devices and channels to shop, with smartphone transactions increasing 18.3% since 2016. Discover more insights in our Festive Season Wrap-up 2017, available below, and be ahead of the game for Festive Season 2018!